Our region has a typical Mediterranean climate with its excesses, long periods of drought, storms and strong winds, with rainfall fluctuating between 500 and 750 mm per year. The Saint-Chinian appellation, created in 1982, incorporates 20 villages located around Saint-Chinian : there is no homogeneity in the terroirs of this appellation, which includes the ancient land on the Cevennes border and the more recent limestone and clay. In short, there is schist in the north, and clay, limestone and sandstone in the south… We are in the south. At an altitude between 210 and 300 m, the vineyards are today made up of 16 ha interspersed with scrubland, pine forests and olive trees, clinging to the slopes of a valley, or exposed to the sun and winds of a limestone plateau. The very complex geology of the Saint-Chinian range is present on the estate, where there is a mosaic of different terroirs and exceptional landscapes shaped by previous generations and passionately maintained today. Syrah-Grenache : with different styles depending on the terroirs. Mourvèdre : a late variety which matures slowly, and which occupies a large part of the estate where it is planted on south-easterly facing terraces, created on steep slopes. 13 to 30-year-old vines. Cinsault : delicate and round, pleasing both in Reds and Rosés. Carignan : fruity and very delicate when grown on limestone, more lively on clay. 60 to 110-year-old vines. Cabernet Franc : planted in 1988 and in 2014 in the deeper and cooler Triassic soils, where almost every year it finds the humidity necessary for its balance. White Grenache, Roussanne, Marsanne, Bourboulenc, Viognier. Clairette : since 2010 it has swelled the ranks of the late varieties. In 2010, on a very beautiful limestone terroir, we bought a vine well over one hundred-years-old, which was about to be pulled out: evidence of the Languedoc’s wine growing past at its best, co-planted with many other varieties including Terret. Grey Grenache : lively and mineral. Languedoc wine varieties planted in AOC terroir; very old goblet trained vines. Pruning method: Goblet – Cordon de Royat. At the foot of rocky cliffs, clay and limestone hillsides, red-ochre soil and steep slopes. Mourvèdre is planted in terraces here. Grenache, Carignan and Cinsault of the Côte d’Arbo cuvée cling to the hillsides. Limestone plateaux and stony soils, the favourite terroirs of Syrah, Grenache and Carignan, whose qualities are expressed here with great finesse. The vines are deeply rooted and withstand drought well. Our white grape varieties are also found here. 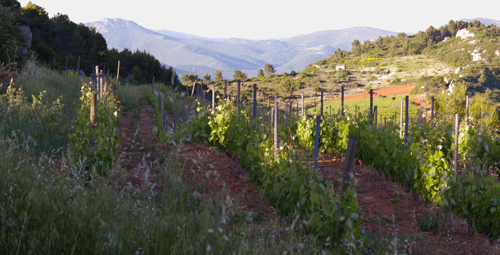 In the valley, there are different types of soil, including the specific and later terroir of variegated marl which adds freshness to the wines. Syrah vines are planted on the lower slopes (Côte d’Arbo cuvée). Cabernet Franc is planted in the deeper soils with PGI classification. For the enthusiasts, here is a little glimpse of the geological map with a cross-section of the “Saint-Chinian range” well-known to geologists and students for its complexity!